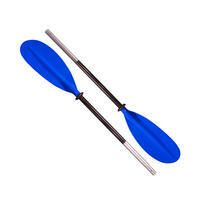 2-Piece Kayak Paddle is lightweight and adjustable and the 2-Piece design allows for easy storage. The GoSea 2-Piece Kayak Paddle, made from an aluminium straight shaft and reinforced nylon paddle blades. The 3 adjustable options on the shaft allow for a choice of straight or offset paddle blades.